Are you watching closely? Good, because you'll need to be if you're to follow the intriguing, entangled plot of The Prestige. The setting is late 19th century London, and the lovely Hugh Jackman (in what must be a career best performance, although I'll admit that's not saying much) plays Robert Angier, an aspiring young magician. 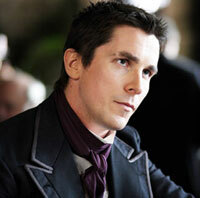 When his beloved wife Julia (Piper Perabo) is killed in an onstage accident caused by fellow trainee magician Alfred Borden (the ever intense and brooding Christian Bale), there begins a deadly rivalry between the two men that can only ever end in disaster. As their furious one-upmanship escalates, so too does their drive and obsession with exceeding the boundaries of reality and creating the ultimate illusion. Brilliantly self-reflexive, the film itself is structured like a magic trick, beginning with 'the pledge', in which the scene is set, moving onto 'the turn', when things begin to change, and ending with 'the prestige', the inexplicable climax of the trick. As such, the film has a lot to say about the magic of illusion and the illusion of magic. Borden is the better magician but Angier the better showman, begging the question: does the art of magic lies in the trick itself or the way it's presented? To a certain extent, the film itself encapsulates the answer: both are equally important. From the finely tuned screenplay to the sumptuous sets and costumes, which evoke convincingly the splendour and squalor of late Victorian London without once resorting to Hammer-esque 'cor blimey guvnor' clichés, the presentation of The Prestige is immaculate. But can 'the prestige' itself, the final twist at the end of the magic trick, live up to our expectations, or will it, like so many other recent 'twist' movies (The Village being a prime example) turn it to be a disappointment? Is there any real magic in the magic trick, or is it, like The Da Vinci Code, a big fat con? Fear not, because the real master magician here isn't either of our two heroes, but director Christopher Nolan and, yet again, he really pulls it out of the hat. Like a true illusionist, he isn't giving away any of his secrets too readily, but when he does, you'd better be paying attention. Just as he did in the startlingly innovative Memento, Nolan feeds us just enough information to make us believe we've pieced the whole thing together - before springing a surprise ending on us that's as shocking as it's unexpected. When you look back on the film, you realise, Sixth Sense style, that all the clues were there from the start, but thanks to some masterly misdirection, you were simply looking the wrong way. This deft slight of hand makes for an elegant and occasionally dazzling piece of cinema that is as absorbing as it's interesting. Throw in a strong supporting role for Michael Caine as the ingenieur who makes magic a reality, some eye candy courtesy of Scarlett Johansson (who appears to have been taking 'unconvincing magician's assistant' lessons from Rosanna Arquette in Desperately Seeking Susan) and a truly bizarre but somehow appropriate cameo from David Bowie (well, who else are you going to get to play a wizard if Sir Ian McKellan's busy?) and - abracadabra! - the result is a real tour de force. You'll like it. Not a lot. a whole lot.